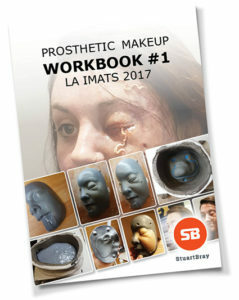 Trade shows like IMATS are a wonderful opportunity for artists to have some fun creating things that they might not otherwise get to do. For some people, it’s to show off a skill or technique or new material. For others, it’s a chance to take chances, experiment and play with some ideas. To indulge in a little playing, pushing some envelopes or exploring with methods which a show schedule just wouldn’t allow. This was my plan with this makeup. I wanted to do some makeups which were effective, relatively straightforward to replicate and understand, and that would be pretty inexpensive to make without requiring tons of expensive materials or materials. 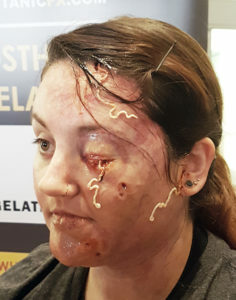 This makeup was made using gelatine from Titanic FX in Belfast, on whose stand I was demonstrating at the show on Saturday. I have taught a few workshops over there in Belfast, and really enjoy it at their studio. Check them out and the workshops and kit they have to offer at titanicfxstore.co.uk/. A s is my way, I like to drill deep into the techniques behind how something is done. If you have been following me on Instagram then you may have seen me putting up live progress reports when I made this a couple of weeks back. If that had piqued your interest, or if you didn’t see it but wished now that you had, then this workbook may be of interest to you. Just click on the image or here to download your free workbook. Literally free. No sign in or passwords – just detailed explanations of my process. Have a read, and pass it onto a friend if you have a prosthetic buddy or colleague. Let me know what you think – I worked hard on it but there is sure to be some errors and ommissions, so if you see something or want to know more, then please let me know! Thank you Stuart for sharing! One day on set of The Walking Dead I was in holding and a Walker came walking through the studio. I said to myself, “Thats so damn cool, I want to learn how to do FX make-up! !” I follow you on YouTube as well as BITY. I am glad you offer kits at a decent rate, cheaper than Amazon. I am inspired and I look forward to leatning more by your tutorials. Thank you for sharing your skills and knowledge.